The mood of the moment is dour post-apocalypses, hopeless expanses of disrupted civilization and bleak sand and rock backdrops. This isn’t escape fiction, it’s a blunt reminder of what we’re pretty clearly heading towards if we keep up our bad habits. But genres need room to breathe otherwise they shrivel and die. Montreal special effects collective Roadkill Superstars seem to understand this with their fresh and invigorating take on post-apocalyptic road movies, Turbo Kid, which received ample buzz at Sundance and SXSW [an earlier version of this review ran as part of our SXSW coverage] not only because of their technical savvy, but because of their handle on human relationships, the way society– post-apocalyptic or otherwise– is at its best when it’s embracing its differences and banding together to triumph over some larger threat. Hyped as ”Mad Max with BMX bikes,” Turbo Kid chronicles the adventures of an orphan boy in the post-apocalyptic wasteland of 1997, after robots have decimated humanity in a war that now appears to be over with no real winners. Aptly named Kid (Munro Chambers), the boy scavenges in order to get by, dropping his goods off at a makeshift town ruled over by a benevolent world champion arm wrestler (Aaron Jefery) in exchange for water and comics. One day while hanging out at a playground, an overly excited young woman named Apple (Laurence Leboeuf) befriends him by slapping a locating beacon on his wrist, making them basically inseparable. Apple isn’t quite what she seems, but Kid doesn’t figure that out until she is abducted and brought to the gang headquarters of Zeus (Michael Ironside), a despot who likes to make his captives fight in a gladiatorial ring that is really just a dried out pool. In the process of saving her, Kid winds up with the “turbo booster” power glove that belonged to Turbo Rider, an anti-robot hero worshipped by Kid through comics. The glove enables Kid to basically shoot Mega Man beams that cause his enemies to explode, providing a handy excuse for RKSS to indulge in some amazingly gratuitous splatter. The gore in Turbo Kid is of the early Peter Jackson variety—blood shoots out in epic streams, body parts are hacked off, intestines get hooked up to a bicycle wheel, that sort of thing. This is never a bad thing as far as I’m concerned but it’s to RKSS’ credit that they don’t overuse the effects, in fact the film is honestly sweet and hopeful more often than it isn’t, with Chambers and Leboeuf’s chemistry indeed standing out as the most enjoyable part of a very enjoyable film. Leboeuf in particular is incredible, playing the excitable Apple with enough hyperactivity and grinning to make you initially tense up expecting annoyance to set in but maintaining a charm that makes it impossible to hate her. The BMX element likewise isn’t as gimmicky as you might suspect, the filmmakers are indeed paying homage to BMX Bandits but within the context of a post-apocalypse where there is no convenient power source or fuel, a bike is a pretty logical way to get around. RKSS also film Turbo Kid as a bright, poppy work rather than the typical drab browns and grays and greens of post-apocalyptic fare, and all the color helps the movie stand out as something really unique. It’s an aesthetic that lends itself well to Turbo Kid’s ultimate message of hopeful defiance against impossible odds and though the film never fails to deliver on the gore and blood, this element is what will make it become a bonafide cult classic in time. Unlike other campy horror and sci-fi works that have been emerging recently, Turbo Kid is less concerned about cool references or gimmicks or campy acting and focuses on heartfelt storytelling and passionate filmmaking. Turbo Kid has the marks of a post-apocalyptic Shaun of the Dead for that reason, and it wouldn’t surprise me at all if the film becomes a sleeper hit now that it has a national theatre run with the backing of the Alamo Drafthouse. 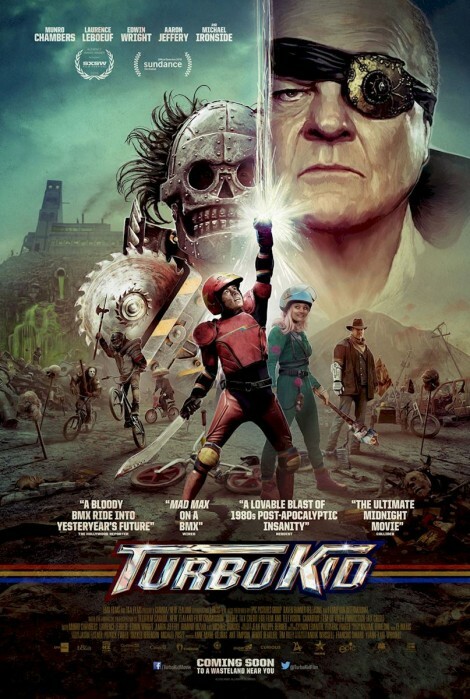 Regardless of how it fares commercially, though, Turbo Kid is a brilliant statement from a creative collective that are clearly going places. 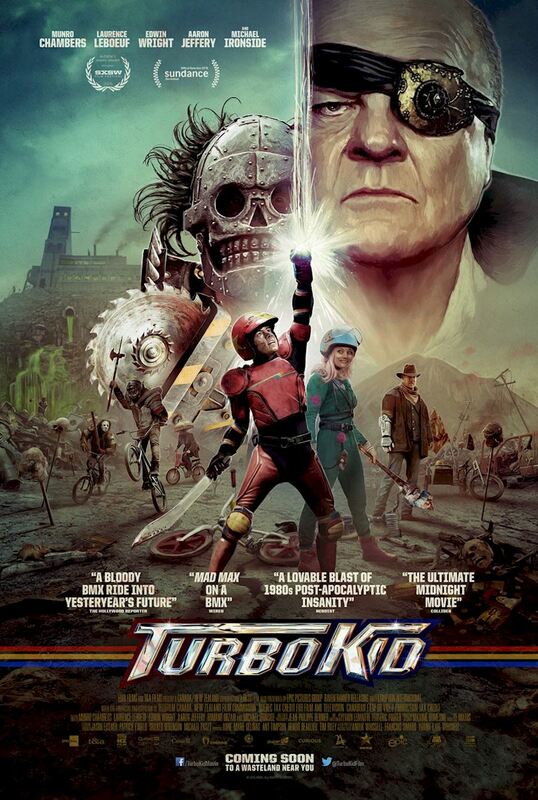 Here’s hoping Turbo Kid evolves into its own Mad Max-style trilogy.